Part of the purpose of doing staff evaluations should be not only to assess how well a person is doing in their ministry but also to set goals as a result of that assessment in areas needing change and growth. However, we must always make it clear that the goals need to be based on the ability of God to work in and through that person to reach their potential in Him. as though effective ministry can’t happen through our weaknesses. Effective ministry is just the opposite and we must be careful we don’t promote unbiblical thinking through staff evaluations. Effective ministry is not dependent on our strengths but rather what our LORD does through us. Effective ministry can happen despite our weaknesses. We can make ministry too much of a man-made endeavor. It needs to be about God working in and through us — His power. God’s power is what must establish the possibilities of potential future ministry and what must fuel the accomplishment of those goals. To come away from a staff evaluation with changes that must be made but feeling it’s impossible to meet up to the expected level of growth is discouraging. But, to come away from a staff evaluation “being confident of this, that he who began a good work in you will carry it on to completion until the day of Christ Jesus” (Phil. 1:6), is outrageously encouraging and motivating! 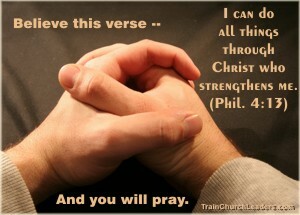 Change is possible because “I can do all things through Christ who strengthens me” (Phil. 4:13).